Like the reindeer, its owner is constantly on the move. Skuollá is located on the border between the national parks Bajdelánnda and Sarek. 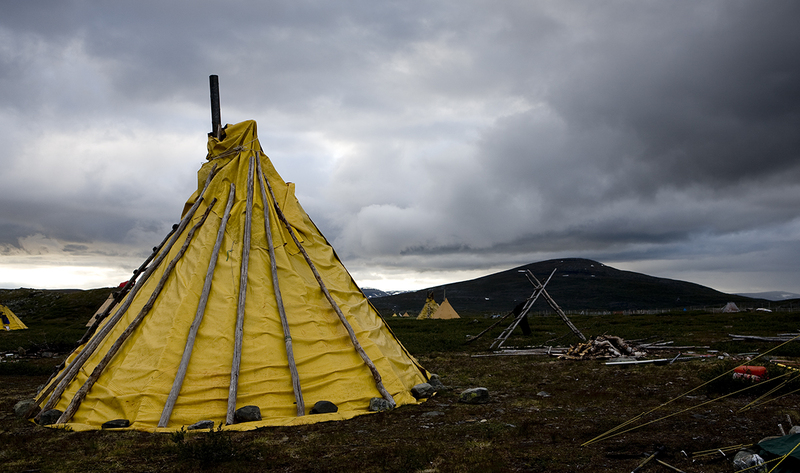 Sirges Sámi community have a large facility here where they mark reindeer calves every year. The work lasts around a week. 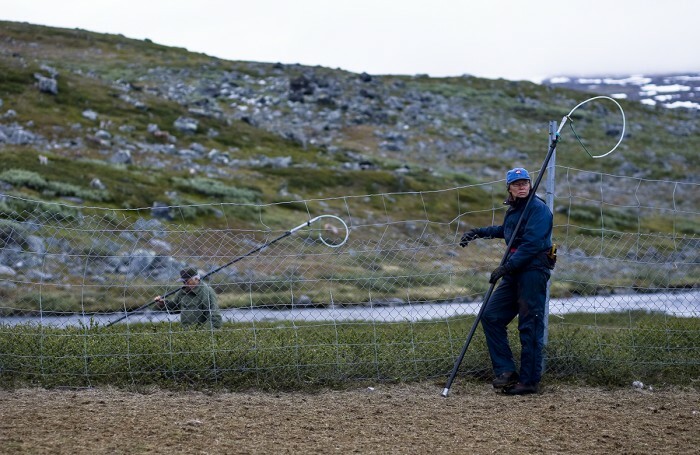 This year they will be using a new method of catching calves for the first time. Instead of using the traditional lasso, everybody is holding rods with a loop on the end. Now it is a matter of ensnaring the small calves. Nobody in the enclosure is allowed to use the lasso. The language used during the first hours might not be something for little children to hear. After a few clumsy and tentative hours making mistakes, people are getting a hang of the technique. The work is done calmly while the reindeer peacefully wander around in the corral. They don’t seem particularly worried. And they don’t complain. “If you enjoy something, you go in for it. And we cut down on some things. Live simply,” she says. She tells me that when their children were small and they had to go out to take care of the reindeer, their aunts and grandmothers helped out by looking after the children. Without them it wouldn’t have been possible. For Elisabeth the change was great. Since she hadn’t been raised with reindeer husbandry, it was an unfamiliar way of life at first. But she decided to go for it during the first years, to see if it worked. And they’ re still on that journey. 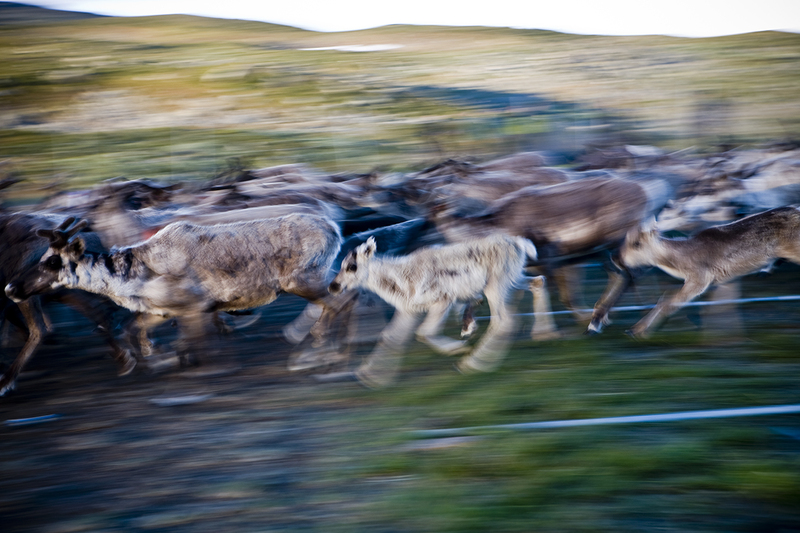 Like in other present-day reindeer herds, the herds of Sirges do not contain a large number of big reindeer bulls. Researchers and economists have calculated that it is most profitable to sell the male calves. As in other Sámi communities they have increasingly gone over to selling calves. “We don’t invest that much in bull slaughter today,” says Per Anders. “Everything we sell now is entirely bonus.” Per Anders says that it isn’t necessary to have very many bulls in a reindeer herd. He reckons that one to thirty is enough. They believe that bull slaughter is more of a cultural tradition in the village. “And that will continue for a long time,” he laughs. Of course they would like to have a herd with many large, magnificent bulls. But that’s not the way it’s going to be. The male calves that they’ re now marking will be sold for slaughter the coming winter. “Economically you can’t wait until the male animals are full-grown,” says Elisabeth. 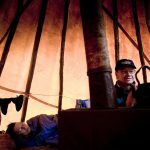 “The only alternative is to work with something else.” So they keep struggling, with a standard of living that the average Swede would not even consider living on. Their machines are not exactly new. The snowmobiles are old, so Per Anders has to spend a lot of time in the garage repairing them. Per Anders argues that the only solution is to reduce the number of predators to a level that he can accept. If he had been able to sell the twenty per cent that are lost, he would have been able to make a better living from this. “In combination with hunting and fishing,” he adds. “Sure, you can get really angry when you find reindeer that have been killed or maimed. But I don’t hate predators. It would be pretty dull if you never saw traces of their existence,” he says. The reimbursement from the state for these losses is not based on the number of animals the predators kill. 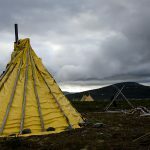 Today the compensation is based on the number of predators within the respective Sámi community. The compensation is not given straight to the reindeer owner, but to the Sámi community. Per Anders thinks that the system has many flaws. “You won’t find all of the predator’s offspring. 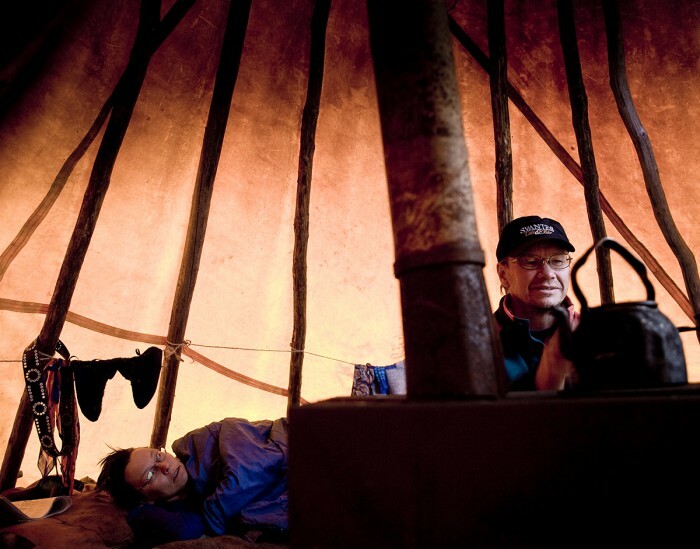 And when it comes to eagles and bears, the compensation is based on the total area of the Sámi community. And the red fox is totally forgotten. It kills calves as well,” he says. Even though he doesn’t like the system, his opinion is that it is better than the previous one. Back then compensation was based on the number of carcasses you found. Skuollá is located as far west as you can go in Sarek. To the east you will find the many narrow valleys that wind their way between the peaks. During the summer there are always tourists wandering along the unmarked valleys. Even though there are never hordes of them, it still becomes a problem according to Per Anders. It is right then in July, when the reindeer are supposed to eat and get fat before winter, that their grazing is constantly being disturbed. The risk they see with the area now being a World Heritage Site is that the area will become more well-known and a popular destination, especially for summer tourism. If things evolve in this fashion, they would like to start limiting the number of hikers. This would give them the possibility to direct and to some extent regulate hiking tourism in the most sensitive areas. 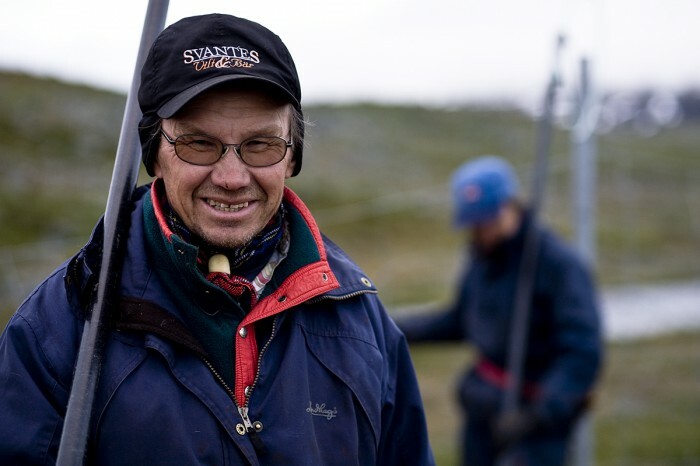 “In winter, from November to April it really doesn’t matter,” says Per Anders. 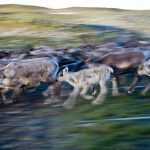 “but during the summertime I have seen that tourists actually move reindeer, exactly like we do, when they come walking along the valley floors.” He thinks there are almost too many tourists, especially within Sarek. For several years, the couple have not only marked calves by cutting notches in their ears. They have also clipped tags onto their ears. With the help of these they can, among other things, see the age of an individual animal. They can also monitor which animals are left in the herd and which have been lost for different reasons. When the morning sun has started to heat up it is time to let the herd out. Despite the setbacks of the first hours, most people are satisfied with the new rod system. And one sign that the marking has proceeded calmly is that few calves are left when the herd is let out. Most of them are running up the mountain slope together with their mothers. For the Vannar family, the goahte tent awaits, with dinner and a few hours of sleep, before evening when the next herd is brought in. 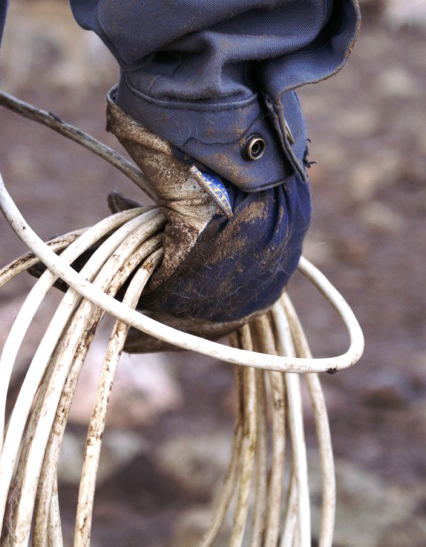 The lasso has been made in a wide range of materials. The earliest were braided. For a long period, hemp ropes were used. Today plastic is used. They exist in many different forms and for different purposes. Softer ones for cold winter days, or slightly more rigid for warm summer nights. The most valuable animal is the reindeer cow, the áldu, which year after year gives birth to calves which it feeds and protects. A reindeer herd today comprises very few reindeer bulls, sarvvis. 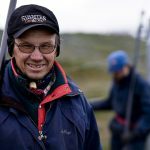 Those who work with reindeer herding and make their way to Badjelánnda past Sarek need to have really strong and sturdy staffs. Then they can jump from one stone to another and wade across the deepest fords without the need to be in water up to the waist. 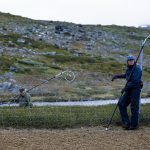 For many years, this staff gave me good protection and support when I waded the fast flowing and deep streams in Sarek. In the field of reindeer herding all over the world there are a vast number of names for reindeer. There are for example names denoting the reindeer’s colour, appearance and different types of horn. There are also an infinite number of words and descriptions of landscapes, and above all snow and weather conditions. 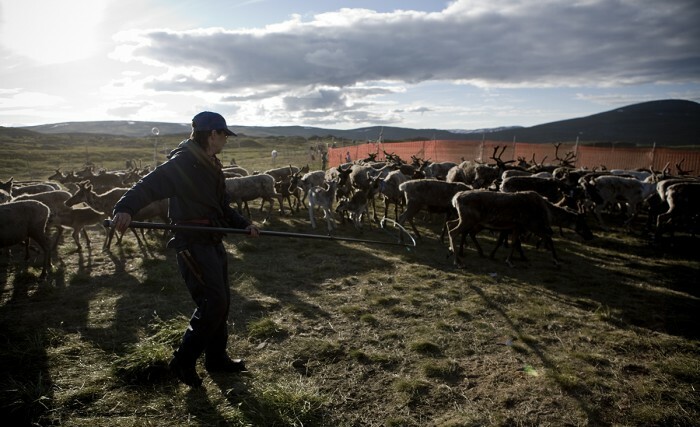 Reindeer herding is widespread and an ancient livelihood, where traditions and know-how have been preserved from generation to generation.